The blog, DISCOVERY: Slave Name Roll Project I am sharing is one to follow. Read her past blogs and gain some tips and steps on breaking down those slave research walls. Share your findings! The 1870 brick wall is no less surmountable in cyberspace than it is in the analog archives of today’s courthouses. Court records from times past divulge varieties of slave/slaveholder relationships. Knowing the records exist is not the same as locating and examining them for myself. I do realize this problem is not exclusive to African Americans. But the fact still remains that it is more difficult due to the fact that my enslaved ancestors were considered chattel property; and, prior to 1870, they had no surnames. And even their given names are inconsistently recorded in the census records that followed. 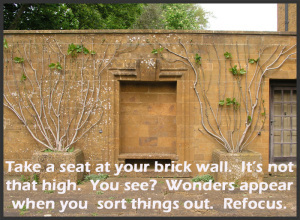 Some have managed to scramble over their brick walls — only to find . . . yet another. Then what do we do? We dust ourselves off and rescale to the other side to devise another way. You’re right that “out-of-the-box” thinking and analyzing records are keys to progress in researching our ancestors. I’ve also found that switching gears then returning to a problem with “fresh eyes” will help me to see what was there along — but in a different light. We can follow rules and outlines as long as we learn how to make the necessary adjustments with each ancestor. Thank you for the re-post.